It's been three weeks since my last post here, and while there are medical reasons for my absence, the truth is that I was also feeling blocked. The beginning of the year was tough- I am shattered by the terrible current events in my birth country (both the attacks on Charlie Hebdo and the anti-Muslim hate crimes that followed make me sick and sad) and in the rest of the world. This is not a political blog, and I don't feel comfortable discussing politics here, but life and feelings and thoughts aren't as easily partitioned as blog topics. I've been trying to get back to the blog multiple times last week, and failed each time. Yesterday, as I was perusing Pinterest, I came at this quote and this one. 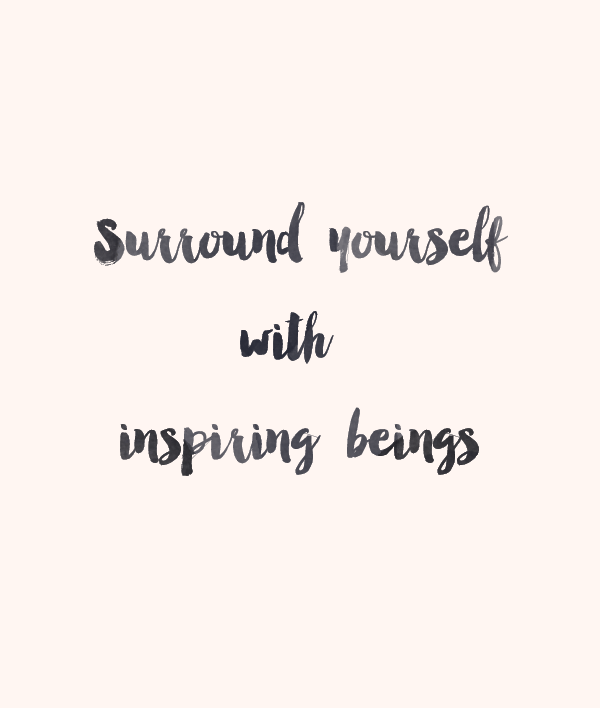 And I thought that this might just be my answer: I may be feeling blocked, but nothing prevents me from sharing inspiring posts from other sources- and in a larger way, to surround myself with inspiring beings. 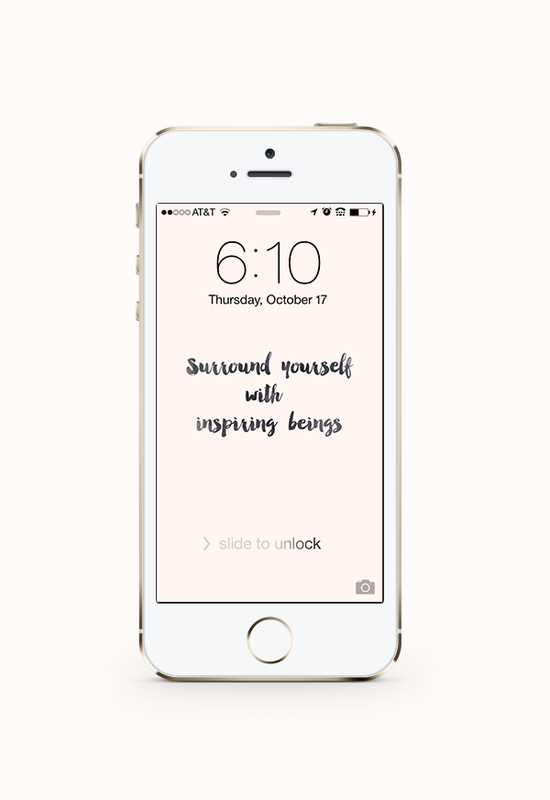 I designed a little iPhone wallpaper as a reminder, that you can download for free below, and also compiled a few of my recent favorite links, that I thought you may enjoy as well. I'm feeling way more inspired already, and happy to be back! - I've been listening to this on repeat. - A new-to-me blog that I look forward to reading. Already printed out the free planners. - A closet detox cheat sheet. - 10 lessons gleaned from 2014 for a better 2015. - A foolproof green smoothie formula. - 8 podcasts to follow this year. - Easy homemade all purpose cleaner. - Vigneta, a free, gorgeous, handmade font. - 8 brilliant Ikea hacks. - An interview I did for Terry's Blinds, including my top 5 design picks for this season. These links are amazing. Thank you so much!. Awesome wall paper it would look awesome in a gold vintage frame! This is so beautiful. I'm going to put it up on my laptop now. I'm also going to share on Pinterest. Continue to seek inspiration...people need this. Thanks for your kind words Jahaila! Lovely freebie, and yes what is going on in the would is really disheartening. I have been following the events in france as well as Boko Haram, the riots in the US sparked by Ferguson, etc. and only feel sadness for the lack of unity between people and the hatred that pulses through some people's veins. I am very scared for the future we have ahead of us, but all we can do is try to make this world a better place incrementally, starting with our own happiness and trying to radiate it outwards. This isn't going to prevent a war from happening, but if the percentage of tolerance increases just a little bit exponentially each day, we might have a fighting chance. Rae, I couldn't agree more with everything you said. I have the same feelings of sadness as you, and I oscillate between fear of the future and hope in humanity. You are right about trying to increase tolerance each day- in the end we have to believe that little streams make mighty rivers. Thank you so much for sharing this! New phone locking background! YAAAASSS! Rio 2016 is a major international multi-sport event in the tradition of the Olympic Games due to take place in Rio de Janeiro, Brazil. We celebrate friendship day on 1st Sunday of August Happy Friendship Day Messages Friendship is a faithful and loyal relationship between two or more person living anywhere in the world.